"How to do halftone color separations in Photoshop". Well, this question doesn't have an absolute answer as there's many ways to address it. First off, one doesn't begin by generating a halftone separation. 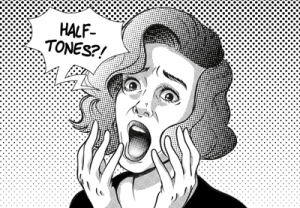 With the exception of Index Separations, which I'll cover in another article, all color separations within Photoshop are actually grayscale channels that contain no halftone information whatsoever. Basically, three methods exist to generate halftones from a completed color separation. The first is to create individual bitmap documents with the proper halftone information embedded from each channel within the color separation. This is accomplished by "splitting the channels" of the color separation into individual grayscale documents. Once split, each document is then converted to bitmap mode. Within the bitmap window upon conversion, the user would enter the required output LPI followed by the desired dot shape and angle. The dot shape can be elliptical or round and an angle that works and doesn't create moire, such as 26 degrees. Each document would then be sent to your printer directly from Photoshop. No other film output settings are needed other than the correct page size. Low cost color separation such as QuikSeps provides an automated process to complete this procedure. The second is to create bitmap halftone channels within the existing grayscale color channel palette. This method is complex and usually requires the use of advanced color separation software such as UltraSeps. The process retains the separation within the channels panel with the designated color applied to each channel. The benefits of a more advanced technique are twofold. One obvious advantage is the ability to preview the color separation itself as halftones and output to film directly within Photoshop. An in-depth instructional video can be found here. The final method is using a RIP such as AccuRip, FilmMaker, etc. "RIP", is an acronym for Raster Image Processor. These RIP's are not to be confused with "Color RIP's", which may be included with your inkjet printer or available elsewhere to control color output. The RIP software referenced are strictly for black ink halftone and solid film output. These programs use sophisticated mathematical algorithms to generate high resolution and extremely clear and accurate halftones from a Photoshop channel separation or vector documents created with Illustrator, CorelDraw or other PostScript application. Unlike halftones within Photoshop through the use of bitmaps, the quality of the dot is far superior when using a RIP. RIP's also provide the added benefit of achieving a higher ink density to film. This is primarily accomplished by using multiple heads in the printer to image black ink and is a process unique to RIP software engineered for the printing industry. The downside is the cost for a standalone RIP is $500 (or higher). This expense can be justified if high quality and easy film output is needed on a consistent basis to run your business. Although if only doing an occasional job, or if printing is strictly a part-time gig, buying a dedicated RIP can probably be avoided. So what's the right solution for you? Well, that depends on your business and budget. If deciding not to use a RIP and generate the halftones as bitmaps within Photoshop, you're not alone. Countless printers use this free method and have been doing so for many years with great results. On the flip side, printers which I'll classify as full-time commercial shops normally use an actual RIP for film output. While a small portion spend tens of thousands on direct imaging systems to eliminate the need for film altogether! If you ask me, if just starting out or working on a small scale, forego the RIP as the $$$ can be of more use elsewhere. And when the day arrives where business is growing and transforms into a full-time occupation, then by all means invest in good RIP software. One bit of advice is to avoid anything claiming to be a RIP but only works from a specific program. We know of one such product that ONLY works within CorelDraw. This fact alone is a major red flag as all actual RIP software will be functional and accessible from any PostScript or Raster program with film output integration. If the RIP doesn't work with everything, its not a RIP and is merely generating bitmaps that can be accomplished without it. Also stay away from free software RIP solutions such as Ghost Script. Although free, its problematic, cumbersome and very confusing. The functionality of Ghost Script isn't mainstream and the program doesn't integrate directly with applications such as Illustrator, Photoshop, CorelDraw, etc. It also lacks just about every wanted and needed feature of modern RIP software and doesn't offer a multiple black ink head option or ink control of any sort.